The selection of Sam Warburton over Peter O’Mahony was a huge call, and one that Warren Gatland has been proven correct on. Warburton was a menace on Saturday, dovetailing beautifully with Sean O’Brien to unsettle an All Blacks attack which looked excellent in the 1st Test. They went after New Zealand at ruck time and made life much more uncomfortable for Aaron Smith after the armchair ride he had a week previously. Last week, the breakdown battle in the 1st Test was central to the All Blacks’ win. New Zealand played with quick ball all day and Aaron Smith looked incredible. The pressure exerted on the Lions’ defence because of their unwillingness to contest the breakdown was massive, and playing on the back foot for so much of the game meant it was almost inevitable the All Blacks would create try scoring opportunities. This week the Lions came out of this contest much better. Before starting, it must be stated that the All Blacks played 55 minutes of the game with 14 men, meaning they played with only two men in the back row as Jerome Kaino was withdrawn to allow debutant Ngani Laumape be brought into midfield to replace Sonny-Bill Williams. Playing for so long down a back row couldn’t not have had a big impact on the breakdown. Warren Gatland confirmed last week that Warburton would come in for Peter O’Mahony and Maro Itoje for George Kruis. Itoje brought huge energy to the Lions team, while Warburton’s ability at the ruck was a key reason for the Lions victory. Moreover, the infusion of Itoje’s energy and combative nature plus Warburton’s leadership and determination to compete at the breakdown rubbed off on the rest of the Lions forwards, who were far more confrontational throughout. In the 1st Test the Lions rarely committed any players to contest New Zealand rucks. Of New Zealand’s 131 rucks the Lions contested only 18 times, or 14% of the time (contrast this to New Zealand contesting 35% of Lions ball). They stood off and tried to organise their defensive line as quickly as they could. The result was predictable: with no contest at the ruck, New Zealand could play the game with as much quick ball as they wanted. Aaron Smith was like a hummingbird, a blur of energy pinging the ball here and there. Not only that, Smith could use quick ball himself, sniping from the base of the ruck with quick ball. In all he carried 11 times himself. The All Blacks gain lined again and again, their attack played on the front foot all day, and the Lions couldn’t get their defence set and off the line quick enough. From the start of the 2nd Test, even before the Lions had a numerical advantage, they were showing far more aggression at ruck time. Here’s a great example. Here we see Sam Warburton and Alun Wyn Jones in over the ball early in the contest, forcing the All Blacks cleaners to work for the ball. Competing at the breakdown like this was very necessary. It slowed the ball, even for just a second. This second is pure gold dust- it gives the defence an extra second to get set, which plugs any gaps and allows the defence to get off the line quickly. Perhaps the best example of this was a brilliant piece of play from Liam Williams in the second half. New Zealand make a line break which is caught by the excellent Maro Itoje. Again at this breakdown we can see Warburton hovering with intent, but it is Liam Williams who gets into a brilliant position to contest the ball on the ground. Immediately the All Blacks are poised to attack a very disorganised Lions defence which has had no chance to set. Barrett is screaming for the ball, with Laumape and Read next to him, and Naholo out wide, perfect to attack a broken defence. Lawes and Sexton are the only two Lions set, with Jones and Farrell scrambling to get into the line. Williams contesting the ruck has slowed it long enough for the Lions defence to get set. It is a brilliant piece of play from him which has almost certainly saved a try. 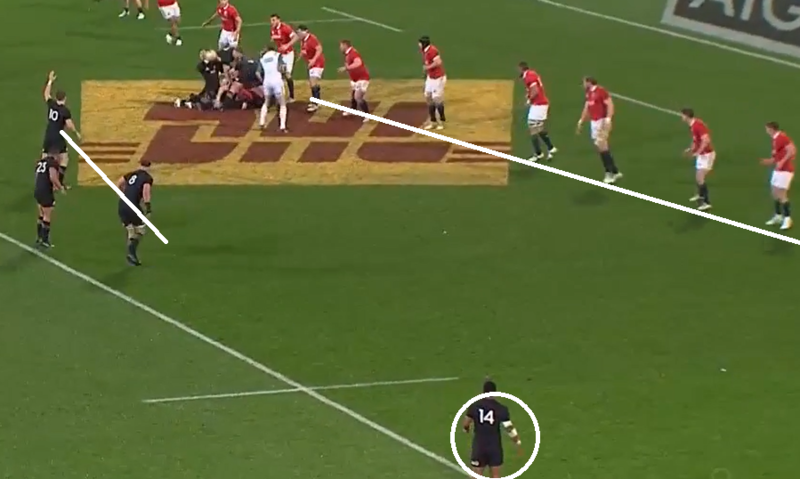 We can see the All Blacks 4 attackers in almost an identical position. But now look at the Lions defence. 8 strong on this side of the ruck, with a perfect line, all ready to get off the line. It forces Barrett into a grubber through which Daly tidies up. Sometimes people don’t notice this kind of work, but Williams entering the ruck and making it a real contest has bought the defence a vital two seconds. Sam Warburton made a nuisance of himself all game. It was almost funny to hear the commentary punctuated every few seconds with the voice of Jerome Garces shouting “leave it 6!”, which must surely have been music to the Lions’ coaching staffs ears. Here we see Warburton loitering with intent, as he did all game. 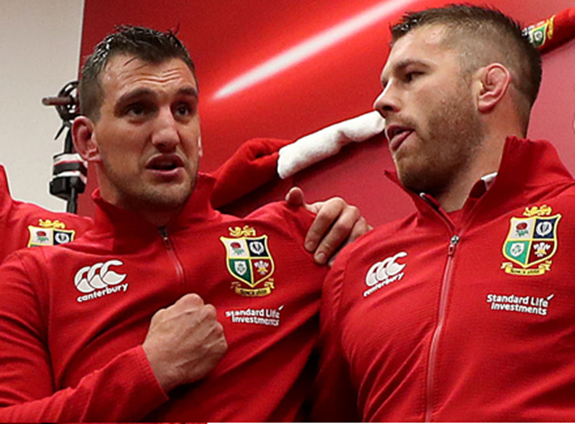 It was notable that the Lions kept Warburton and Sean O’Brien in the middle of their defence as much as possible, with both putting in huge tackles and hovering with a view to contest. 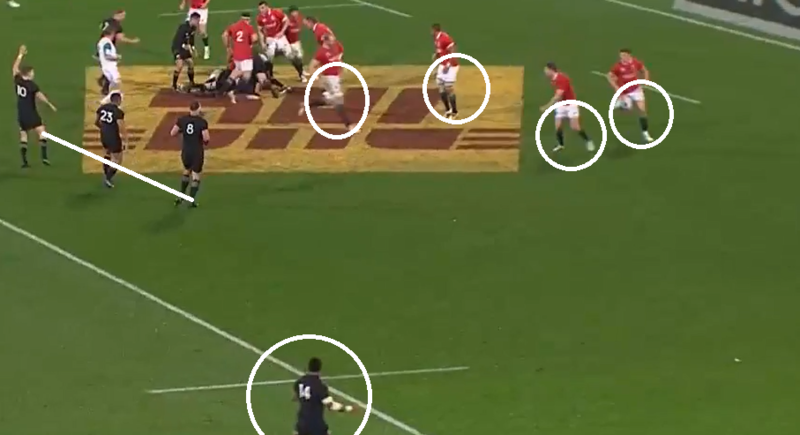 Despite there being 5 All Blacks in the picture, plus a ball carrier, it is Warburton who gets to the breakdown. He gets to the ball first and would have won a penalty for the Lions, but that Garces was playing advantage for an earlier infringement. Even still, it is well worth contesting, as the All Blacks have made a habit of scoring from advantage plays. The Lions attitude had changed and they set out to contest far more often and with more aggression this time around. The statistics bear this difference out. In the 1st Test the Lions contested 14% (18 out of 131) of New Zealand rucks. In the 2nd Test, this improved to a respectable 28% (22 out of 78) of All Black breakdowns contested, double the rate of the 1st Test. The selection of Warburton was crucial to this change. One other factor the Lions improved upon was their spacing at ruck time. Aaron Smith’s sniping from the ruck was seriously limited because of the ability of the Lions to slow the ball. In this game, he only carried himself once in the game, in contrast to his 7 carries from the first game. 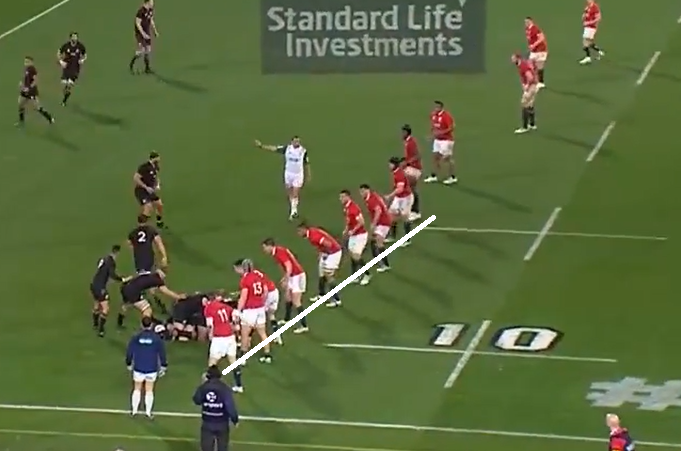 The Lions fringe defence set up much tighter than in the 1st Test, closing off gaps for Smith to attack and challenging the All Blacks to move the ball wide in very wet, testing conditions. 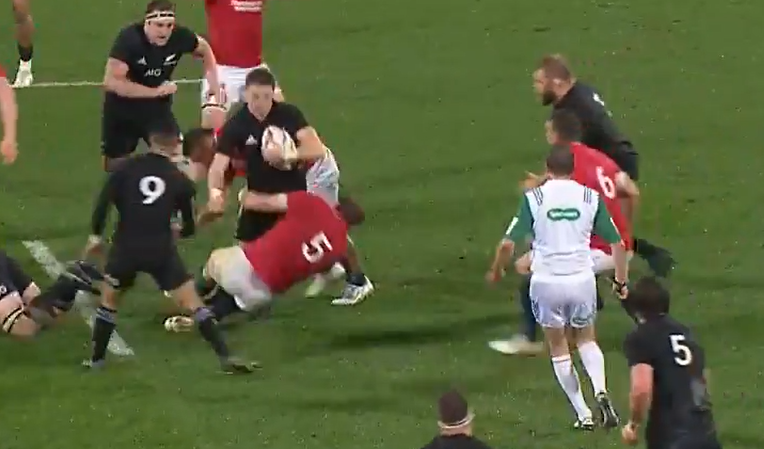 Here we can see the Lions have made sure the All Blacks will not make any easy yards around the ruck. There are 9 Lions players within 15m of the sideline. And a further 4 players between the 15m line and centrefield. 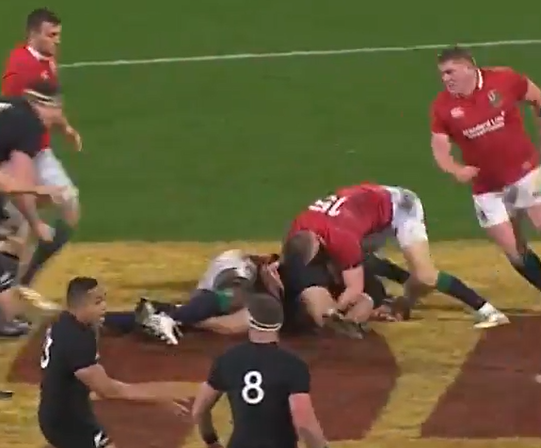 The Lions learned their lesson from the first game and if they couldn’t contest the ruck to slow the ball, made sure they had numbers close in forcing the All Blacks to move the ball. 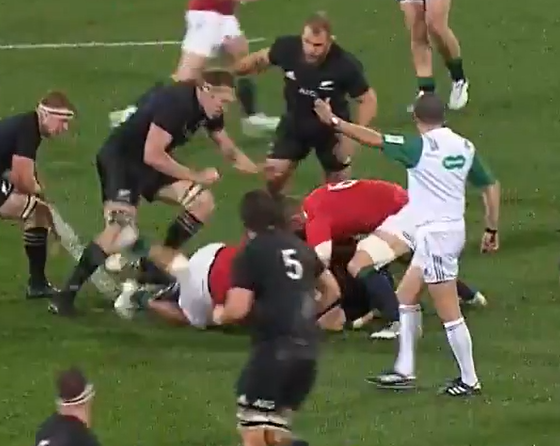 The breakdown battle is crucial to any match, and even more so when playing New Zealand. This battle was lost in the 1st Test, and won in the 2nd Test. Whoever wins the 3rd Test will have managed to contest more often and disrupt their opponents’ rucks. In Warburton and O’Brien, the Lions have two flankers who can really compete, but in the 3rd Test they’ll face Cane and Kaino for a full 80 mins. It’s going to be fascinating to see if the Lions can be as aggressive again. And one thing is for sure, O’Brien and Warburton will be marked men. Super analysis, love it. Really looking forward to the 3rd test. Should be brilliant. Beware the wounded All Black!